The siamang is a gibbon species found in the upper canopies of forest regions of Malaysia and Indonesia. Adults can weigh up to 45 lbs and grow as high as three feet. Males are larger than females. They have black fur with long and somewhat saggy hair, and there is also a large and inflatable throat sac near the side of the head, called a "gular sac," which is used as a resonator for their vocal cords. The siamang's feet are webbed (between the second and third toes), and it has no tail. Siamangs prefer social groups consisting of one male, one female and their offspring. Most apes prefer to build sleeping nests or platforms to sleep on, but the siamang sleeps upright with its arms folded and head between its knees. Siamangs prefer to be active and feed during the day. Diet consists of fruits, leaves and plants, and small animals and insects. They are very territorial, and the father and young males work together to defend their territory. 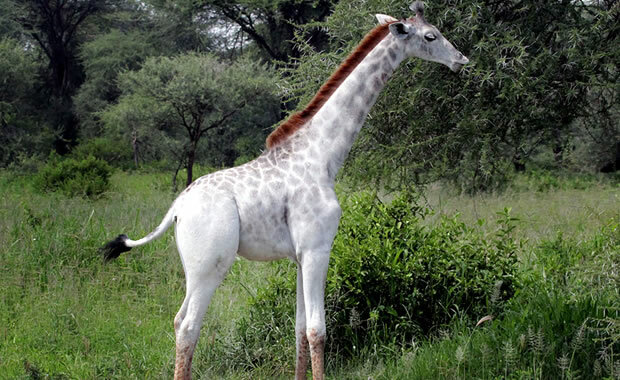 The female gives birth to only one young after a gestation period of seven to eight months, and all the males in the group take an active part in caring for the young and have even been seen carrying the young in their arms. Siamang populations have declined due to habitat loss from the clearing of forests for palm oil production. They are also captured and taken from the wild to be sold as pets. Copyright Notice: This article is licensed under the GNU Free Documentation License. 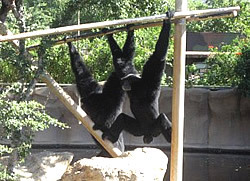 It uses material from the Wikipedia article "Siamang". Glenn, C. R. 2006. "Earth's Endangered Creatures - Siamang Facts" (Online). Accessed 4/25/2019 at http://earthsendangered.com/profile.asp?sp=422&ID=3.